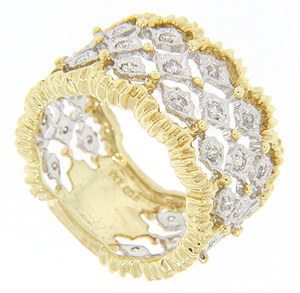 This two-tone 14K gold wide antique style wedding band features an open design. 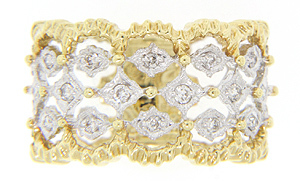 Studded with .45 carats total weight of diamonds, the wedding band also has textured gold giving the ring a shimmer and shine. The sides of the ring undulate in a wave type pattern. Size: 8. We can slightly re-size.